It’s not too often that I get to have a one-on-one date with one of my kids. They’re at school during the day and we’re busy (or together) at night. So the other day, when Reese was home from school recovering from an ear infection, I decided to take advantage of some mom and me time. 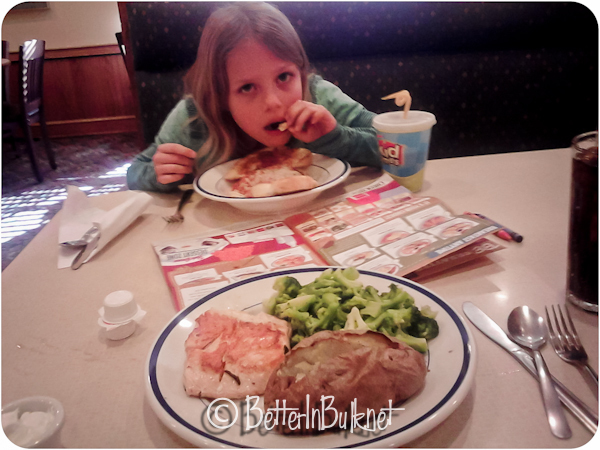 I had recently been introduced to Bob Evans’ new Fit From the Farm menu. They’ve designed a menu that is so healthy you can eat all 3 meals at Bob Evans and stay under the government suggested 2000 calorie per day limit. Since I’ve been trying to be more healthy, Bob Evans’ selection of meals that are 650 calories or less sounded perfect. I ordered the salmon for our lunch together (along with a nice big serving of broccoli and a baked potato). It was fabulous and filling, and under 500 calories. Not only was the food yummy, but the service was stellar. That’s always a huge factor in whether or not I am going to return to a restaurant. These pictures from my phone illustrate how much fun we were having together. And, yes, I added butter and sour cream to my potato…. Linked up to Wordful Wednesday, Wordish Wednesday, and Wordless Wednesdays all over. Link your Wednesday post up below! Disclosure: I received a certificate for a free Fit From the Farm meal at Bob Evans, and paid for Reese’s meal on my own. Happily. I am totally going back for more. Awesome pictures…you guys are hilarious. Looks like a super fun way to spend a sick day! 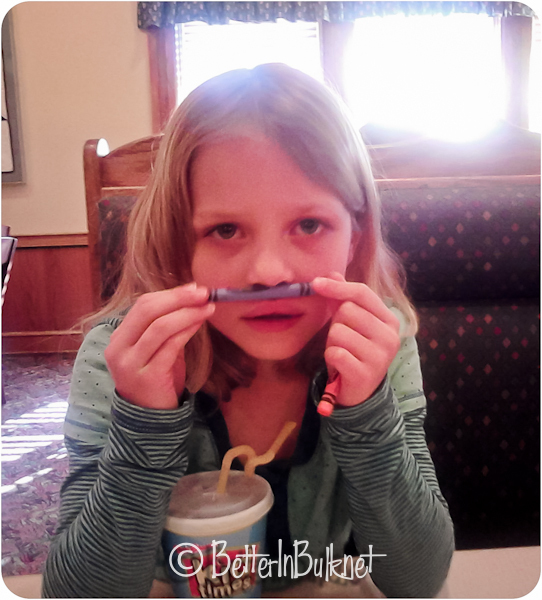 It’s always great to find a family restaurant where the food is great! Glad you got to enjoy one on one time with your baby. Food actually looks half decent! Yum! Looks like you two had a good time. We don’t have any Bob Evans restaurants around here, or else I’d try the new menu. Oh well, next road trip. I love those days when they are just “sick” enough to not go to school but well enough to have some rare quality time together. Lunch looks yummy too!! I love the trend of healthier meal options at chain restaurants. I know Applebee’s is introducing some 500 calorie options. 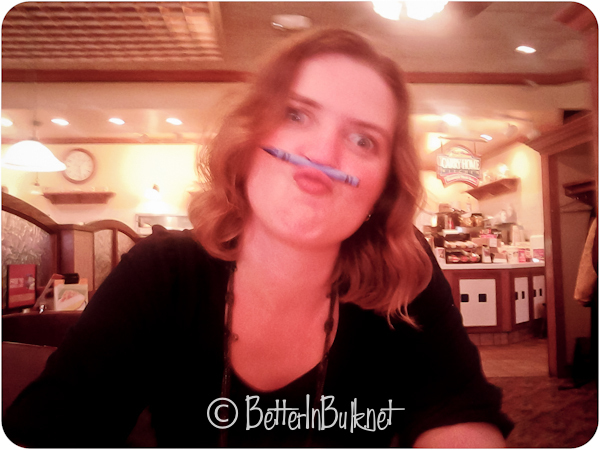 Love the silly crayon pictures :) Have a great rest of the week and thanks for the linky! I enjoy Bob Evans too. Great food. Omgosh. I almost spit out my coffee. I have photos almost EXACTLY like this of my daughter and I. Happy WW! Ya know, I don’t think I’ve ever eaten at Bob Evans. Good to know that they offer lower calorie options. One on one time with the kids is always great, especially when you have a large family like we do! I love those silly photos of you and your daughter. Too cute! I love to have “date day” with my kids!! My sister and I always used to do that with pencils. Looks like a fun visit. One on one time is so important. It’s worth the effort. so glad you guys had a yummy and fun lunch. So nice to get one on one time. What a great way to spend a day! LOVE the pictures! So sweet. Love my one on one time. I finally found your button so I could add it to my WW bunch. lol. Isn’t it mandated somewhere that you have to add butter AND sour cream to your potato! :) Looks like you guys are definitely having fun.